Huddersfield have sacked manager Peter Jackson after a poor run of results. 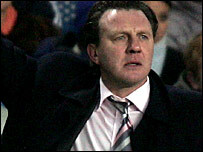 Jackson's second spell as Terriers' boss began in June 2003, but the club decided to act with promotion from League One now looking unlikely. A statement said: "The board's minimum aim for the season was to achieve a play-off position, but this objective is looking remote." Academy manager Gerry Murphy has been placed in temporary charge, starting with Saturday's game against Bradford. Jackson's last game in charge was a dismal 5-1 defeat to Nottingham Forest on Saturday. That left the Terriers 15th, 11 points off the play-off places. The board of directors' statement blamed the club's predicament on "form and inability to attract key players". It continued: "Peter made a major contribution to the club as it emerged from administration and helped us achieve out early successes. "We would like to thank Peter most sincerely for his services over the last three-and-a-half years and wish him the best for the future." Jackson also managed the club in a two-year spell between 1997 and 1999.